Is sustainability good for my wallet? The positive impact of ESG investing (Environment, Social and Governance) for people, the environment and for society is clear. More is being invested in companies with a good ESG score, with positive consequences for our environment, working conditions and the management of companies. This improves the financing conditions of these companies and makes it easier for them to achieve their goals. But what about the financial return? Well… we can be positive about this, too. The vast majority of academic studies conclude that there is a positive correlation between the financial performance of companies and the ESG score. A meta study by Friede, Busch and Bassen (2015) analysed the results of approximately 2,200 studies which examined the relationship between ESG and financial performance. Ninety-percent of the studies did not find a negative relationship and the vast majority found a positive relationship. A recent study by MSCI (Giese, Lee, Melas, Nagy and Nishikawa, 2017) also found a positive relationship between the ESG score and profitability (and also with the dividend yield). Recent history of actual stock market performance shows that ESG investing performs as well as traditional investing. 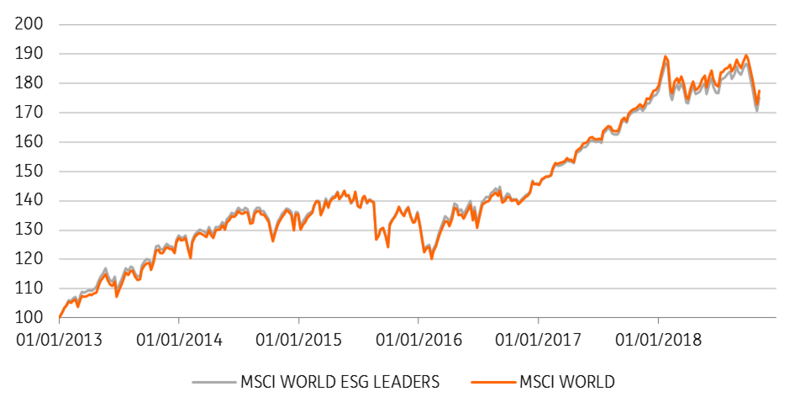 In the graph below, we compare the returns of the MSCI world stock index, the broadest benchmark of global stock markets, and the MSCI world ESG leaders, a portion of the MSCI world stock index of companies with a very high ESG score. The graph shows that the financial return of the two indices follows the same path. We do underline, however, the importance of investing over the long term. As with all other investments, the value of ESG investing fluctuates, which entails a risk for the investor. But here too it becomes interesting for the investor because research shows that fluctuations in ESG investments are lower in the longer term due to the extra risk filters (Giese et al., 2017). The risk of serious incidents that affects the valuation strongly negatively, for example, is lower. The other side of the coin, however, is that the number of possible investments decreases if one opts for an ESG investment. This ensures that deviations from the "benchmark" can be greater in the short term. Suppose, for example, that the oil price rises sharply, causing oil companies to do well. Since oil companies are less present in an ESG portfolio compared to a broad benchmark, the ESG investment will perform less well than the benchmark. So we can conclude that the financial characteristics of ESG investing are quite attractive. In the long run, returns follow the same path as more traditional investments and on top of that, the average volatility is also lower compared to traditional investments. In the short run, however, an ESG investment can deviate sharply from the benchmark, which might be a negative for some. In the final part of our series on sustainable investment, we zoom in on the drivers of the trend towards a more sustainable world. Will this trend towards sustainability continue? Click here to read it.